According to calculations world population till 31st October 2016, is said to be 7.4 billion. Geographically Pakistan is located at such a position that in the North Pakistan has China having total population of 1.38 billion, on Eastern border we have India with population of 1.33 billion; if we include with it Bangladesh, Indonesia, Japan, Myanmar, Far East etc. this collectively becomes 3.5 billion of human beings. In this way on the one hand we have a dozen of countries having most of the population while on the Western side of Pakistan we have the resources of energy found in the earth that have much importance in fulfilling the need of the world population. 60% of these natural energy resources are present in the Central Asian states whose only route of transportation to other countries passes from Pakistani Gawadar port. In order to explore these natural resources and export them to the world, Soviet Union attacked Afghanistan in 1978 with all her military power, latest weapons and well trained manpower with the hopes of capturing Pakistan’s Gawadar Balochistan in an attempt to reach warm waters. If Soviet Union had succeeded in her plans, now not only the history of the world but situation would have been different. The control over Gawadar port would have provided Russians opportunity to control oil containers from Gulf countries to the rest of the world and Russians would have been able to black mail USA as well. Our those so-called analysts who criticize Pakistani policy of 1980s to trap Soviet Union in the Afghanistan through Guerilla war in order to stop her nefarious plans; they should keep in mind that at that time Afghanistan was ruled by Najeeb Ullah a pro-Russian ruler. Those who felt proud in being known as COMRADES were busy in conspiracies of Greater Balochistan and Greater Pakhtunistan. These traitors had prepared maps of rest of Pakistan consisting of Punjab and Sindh after separation of proposed Greater Pakhtunistan and Balochistan. These so called progressive and moderate analysts used to discuss Pakistan as a Failed State in their sittings / gatherings and disintegration of Pakistan in the future as they were discussing failure or success of some movie. There is also a need to analyze the Soviet plan to reach warm waters by capturing Gawadar with the historical aspect that any army in the past after crossing the Western mountains that part of India where now Pakistan is located was stopped only at Panipat or Central India. 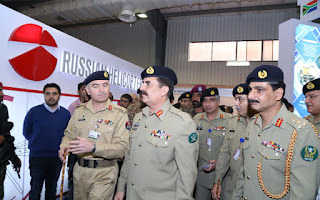 While Pakistan did not had the military capability to face Soviet Army and in case of war with Soviet Union we could not leave our Eastern Border as well because India was already prepared to destroy Pakistan without wasting a moment. Afghan Jihad is a separate story and topic. However, this is a bitter reality that in 1989 when Soviet Army had to retreat from Afghanistan, the after effects of Moscow’s defeat had reached Central Asian States. These states are full of natural resources; despite of exploration of these resources they were exploited because on the one hand it was not possible to transport these resources over Arctic ocean while on the other hand Russians failed to secure access to warm waters. Due to defeat of Soviet Union one after other Central Asian state got freedom and Moscow was unable to stop disintegration of these states. USA and her oil exploring companies also exploited this situation and bought rights for exploration of natural resources in Central Asian states. That was the reason behind the deal between Islamabad and Moscow finalized by Junejo govt. in March 1988 which laid foundation of worst civil war in Afghanistan. The plan was to make Afghan fighters fight with each other so that they get so much weakened that they cannot threaten US interests. The result of long civil war came out in the form of US backed Taliban govt. In 2001, when USA attacked Afghanistan under the allegations of supporting Osama Bin Laden in 2001, the one reason behind US attack was natural resources which USA wanted to control. Keeping in view the purpose of US attack over Afghanistan, Pakistan finalized deal with China in 2002 for construction of Gawadar port; the construction was completed so much quickly that even Chinese were astonished that in the short period of 2.5 years the region’s biggest deep water sea port was finalized. The blueprints of the future economic powers who are going to lead the world became clear to the whole world. After 2001, in the way USA with the help of India forced Pakistan into hell of terrorism, is no more a secret. It was not possible for USA to directly attack Pakistan to stop the Gawadar port construction or construction of trade route from China to Pakistan. In order to stop trade route plan, separatists were launched in the name of rights of poor Baloch who were already in contact with India. All those areas from where this trade route has to pass were targeted by terrorists; in this way USA along with other world powers converted war on terror into war against Pakistan. China continued construction work over Gawadar despite of killings and kidnapping of her workers. It became clear that center of development is shifting from West to the East in which China will have the main importance due to cheaper manpower. USA and West also shifted their attention to Asia especially India; the start of industrial activities on the greater level made this clear that the proposed revolution is not possible without availability of cheaper energy whose cheapest source was Central Asian states while Pakistan laid in between increasing the importance of Pakistan manifolds. India increased her aggressive activities in Pakistan following her imperialist designs. India realized that if India has not been divided on the basis of Two Nations theory in 1947, than Indian borders would have met Afghanistan and Iran and she did not had to look to anyone in order to fulfill her energy needs. The capture of Pakistan lying in the way was already pivotal point of Indian Foreign policy which became further important for India. India started converting herself into cache of weapons despite of being nuclear power. She attempted to deceive world that her purchase of weapons is for China but the weapons she is purchasing are not suited for war with China over the frozen borders but imperialist designs against Pakistan. Moreover, Indian army’s main deployment is in the cantonments near Pakistani borders, Indian Air force battle controls have been established near Pakistani borders, Indian defense budgets and analysis all are based against Pakistan. International analysis also compare Indian army’s capability with Pakistan that means that international community also acknowledges Indian war mania is against Pakistan only. The military strategy of Pakistan has been always aimed at defense only. Pakistan has neither participated in race of weapons with India nor ignored Indian nefarious designs. However, remaining within the limited resources Pakistan has made her defenses so strong that Pakistan can give befitting reply to any misadventure by India. 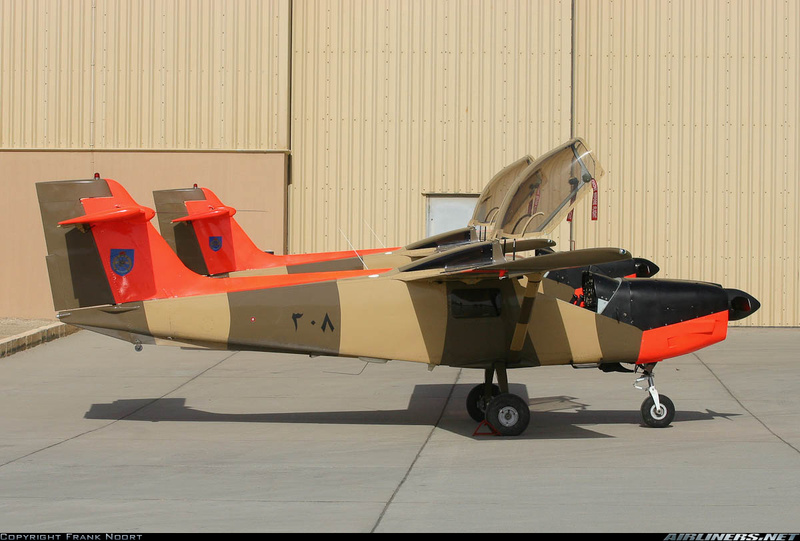 For this purpose in spite of relying upon others Pakistan preferred to become independent in manufacturing of weapons. Procuring nuclear power as compared to India, Pakistan did not develop weapons of mass destruction but prepared tactical weapons and missiles that can deliver the war head to the target with lightening speed. Achievement of such tactical technology has forced India to think before any misadventure like 1965 or 1971. 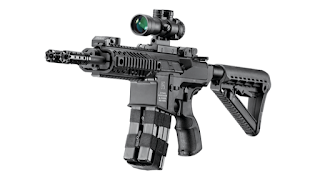 When Pakistan developed independence in traditional weapons, Pakistan started exporting these weapons to other countries according to the international rules and regulations in order to earn foreign exchange. For this purpose “Defense Export Promotion Organization” (DEPO) was formed in 2000. The purpose of this organization was to provide such a platform to the world so where they can see the performance of Pakistani technology in order to facilitate them to take decisions. For this purpose International Exhibition and Seminar (IDEAS) was developed. This is such a great milestone that has been achieved by few developed countries only in which Russia, USA, UK, France, Germany, Italy and Australia have the expertise. Pakistan is the first country from Islamic world and Asia to achieve this milestone of such exhibition. 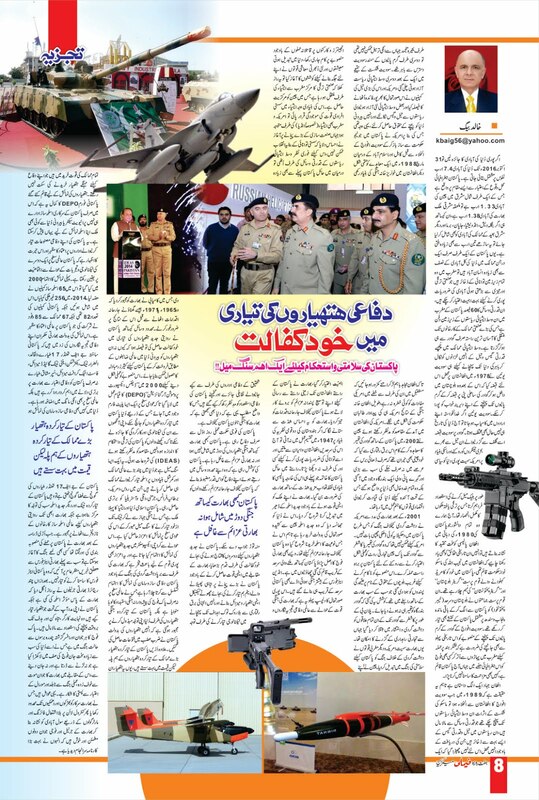 In this series, the weapons are displayed in the Karachi Expo Center. 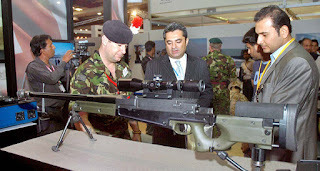 This is also worth mentioning that despite of Indian fueled terrorism this exhibition of weapons is successfully being conducted. It has made the capability of Pakistan army clear on the international level. 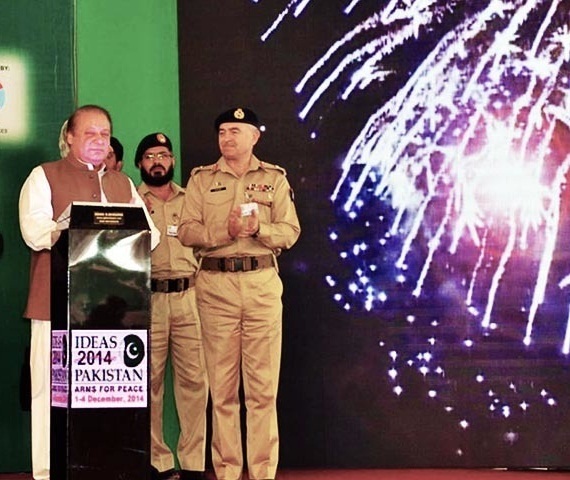 World has been forced to pay attention to these weapons manufactured by Pakistan through which Pakistan army has been able to get victory in Zarb-e-Azb. 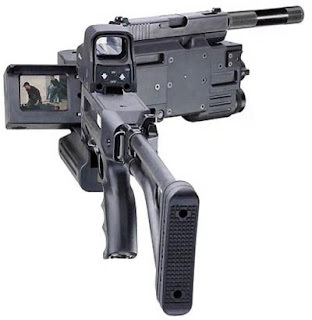 Moreover, the weapons developed by Pakistan compete with the weapons developed by the world powers / developed countries in their technology and capability but much cheaper. As Pakistani manufactured weapons are within the purchasing power of the countries who cannot afford costly weapons of the developed countries. Moreover, any firm from private sector or any other country can participate in DEPO as well. This shows the Pakistan’s belief in its technology that Pakistan allows others to showcase their weapons and technology as well so that friendly countries can benefit from each other. The exhibition was held in 200 in which 65 weapon manufacturing companies participated. In 2014, 256 foreign companies participated while number of Pakistani companies was 82. 85 envoys from 67 countries attended this exhibition. This shows the trust of international community on Pakistan despite of Indian propaganda against Pakistan and terrorism in Pakistan. 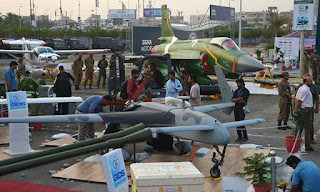 Due to this exhibition Indian rulers are being criticized by defense analysts as Pakistani developed JF-17 Thunder, Al-Khalid Tank, Al-Zarrar Tank, Anti-tank guided missiles, fast attack craft missile etc. 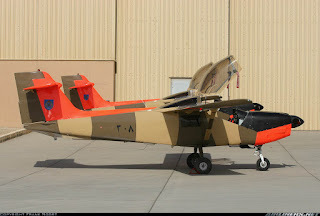 have played important role in giving superiority to Pakistan in the field of defense. 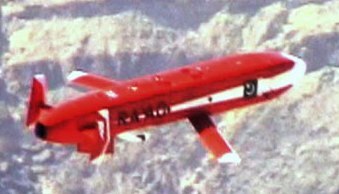 Pakistani missile are also getting demand on the international level as well. No matter where the defense exhibitions are going on, JF-17 Thunders are present there. 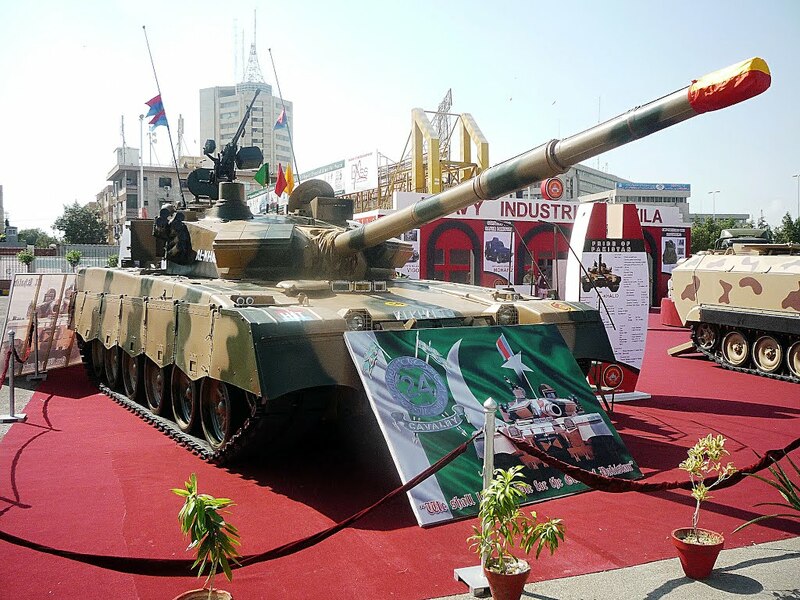 Pakistani developed tanks and APCs are procuring international attention.